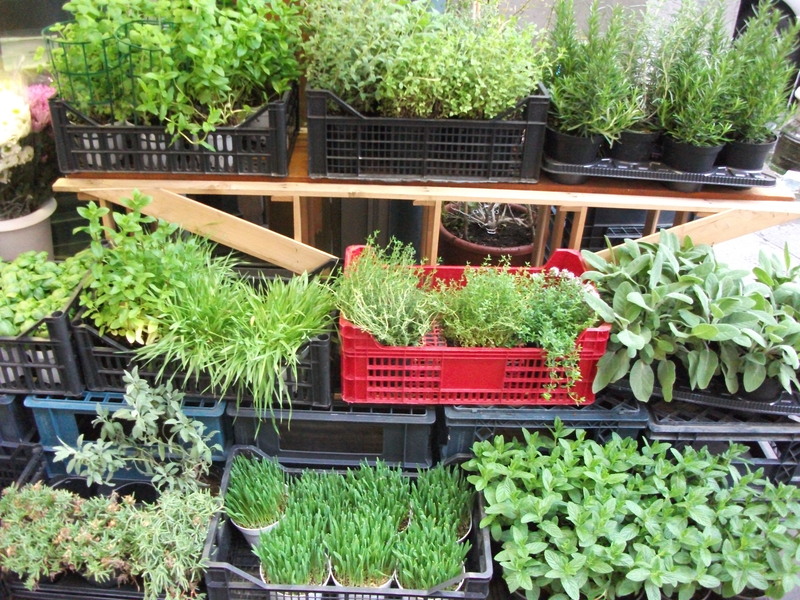 Churches, Dogs, food, Italy, Rome, Travel - bon voyage! If UK citizens are honest, they’ll ‘fess up to the fact that although the recent Royal Wedding provided some necessary uplift of spirits in the land, the best part of it was not Pippa Middleton’s derrière (no matter how pert), but the national Royal Wedding holiday that was bestowed on we lowly subjects of HM the Queen. It meant that between Easter and the first May Bank Holiday, if said subjects took just three days of annual leave, we could enjoy a whopping break of 11 days away from work. Monsieur and I took full advantage of this, having had a pretty rough year to date, enjoying family time, a brief Staycation and a few days in Rome. One evening, whilst visiting the Italian capital, we ventured across The Tiber to the district of Trastevere, to visit the ancient church of Santa Maria di Trastevere. 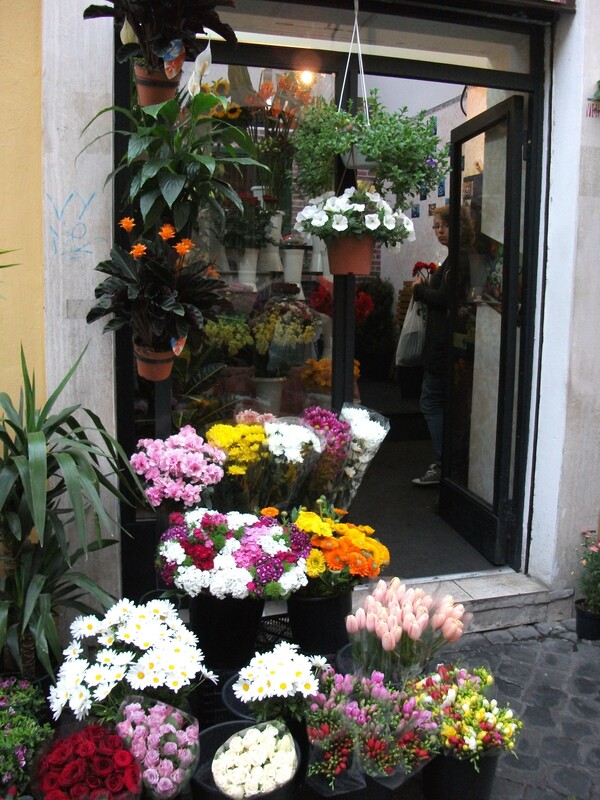 This delightful area has formed its own distinct character within greater Rome, incorporating tiny winding and cobbled streets, chi-chi boutiques and the all-important business of bars and restaurants abounding in all directions. 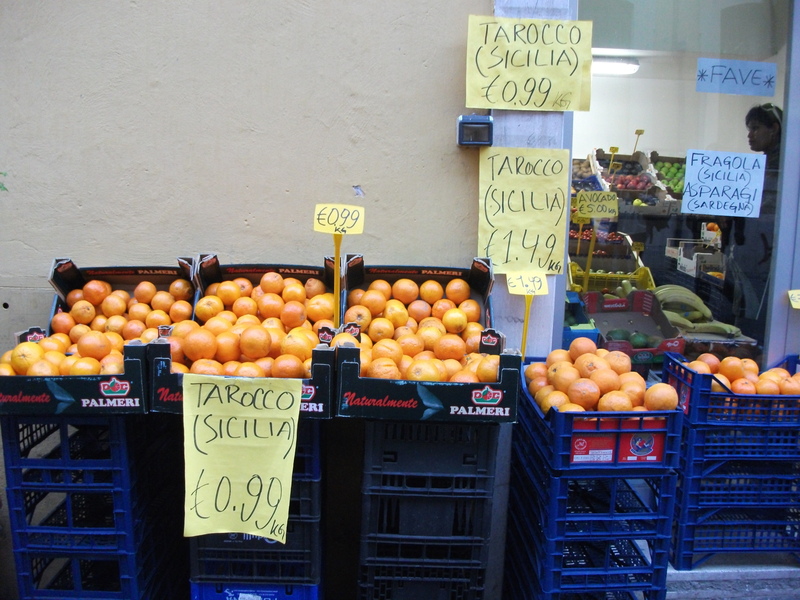 As we wandered about, exploring this wonderful microcosm of Italian-ness, we spotted stalls selling juicy Tarocco oranges from Sicily; known for their blood-red flesh, they are popular for being sweet, seedless and having the highest content of Vitamin C of any orange variety. 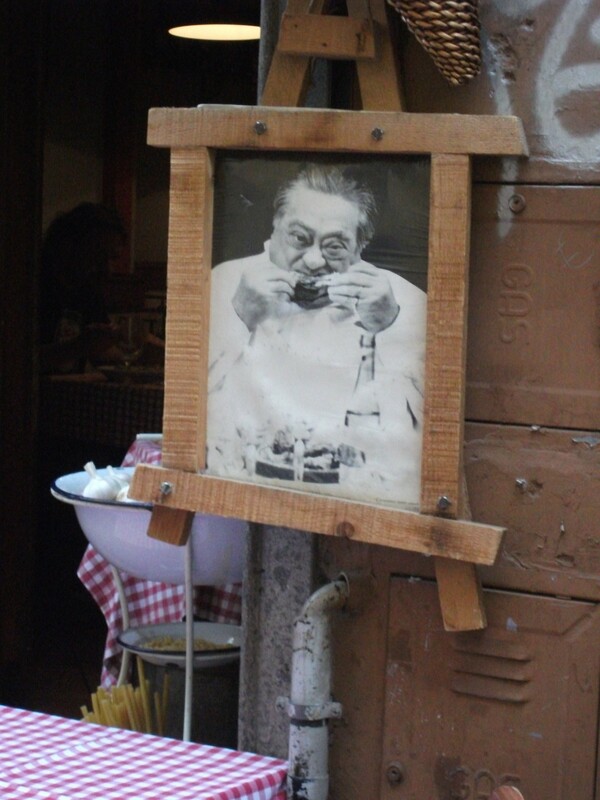 Monsieur and I laughed out loud at the overt gluttony of this image, posted outside a restaurant on one of Trastevere’s busiest restaurant streets. What was his purpose, we wondered, to encourage eating or dieting? This dog lay outside the church of Santa Maria, gnawing with purpose at the label on a discarded plastic water bottle, until it came away, at which point she panted with satisfaction, stood up and trotted off. 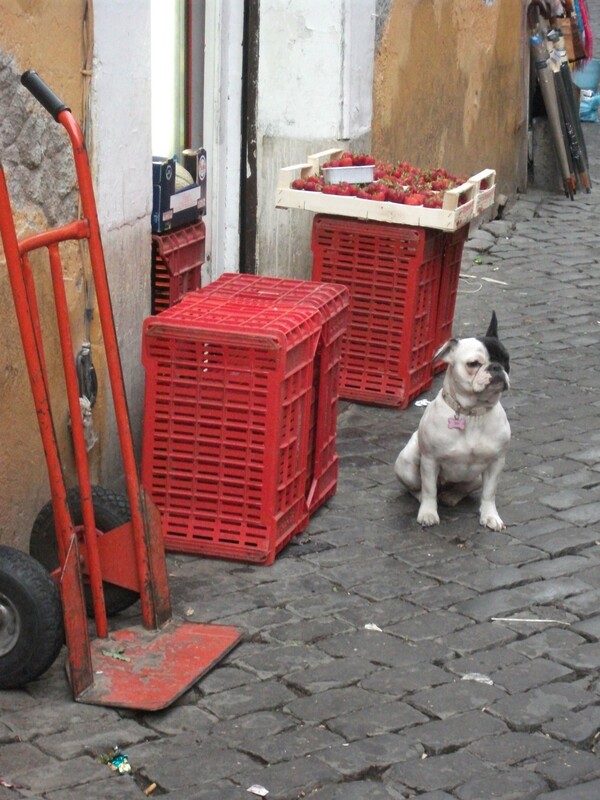 And this canine darling, with diamante-studded collar, sat proudly guarding HER grocery shop. “Hello, dog!” I said by way of greeting, only to be snubbed as one wet nose sniffed the air with a marked disinterest in human interlopers. “Darling, the dogs here don’t speak English. They’re Italian,” Monsieur laughed. Unfortunately, we didn’t have much time in Trastevere – just long enough to explore a little and dine before returning to our hotel, but it is a unique place filled with character and, with a little help from the latest coin tossed into the Trevi Fountain, I’d love to return to discover more of its secrets. I like wandering around different places and taking photos of random things that catch my attention. 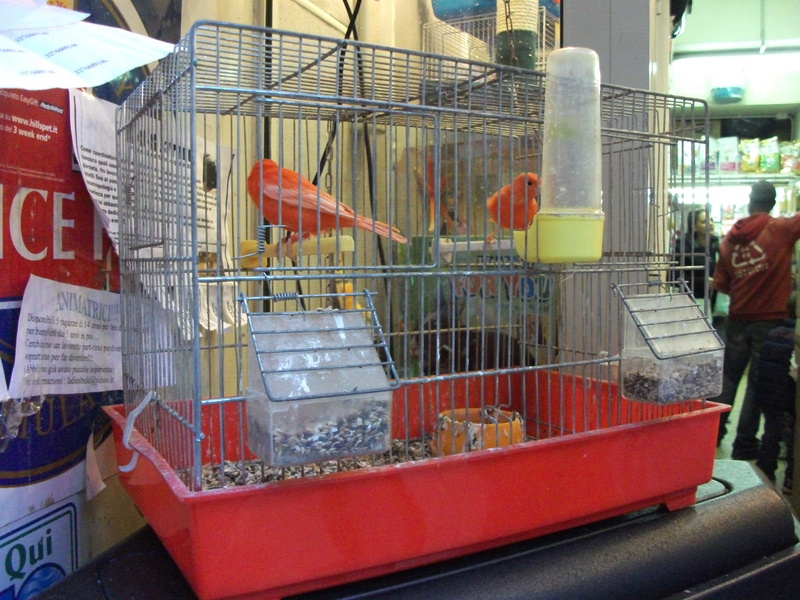 I don’t know why I take some photos … but they usually come in handy on the blog eventually. I’ve been to Italy twice, but never Rome: I don’t know how I could have missed it twice. note: Pippa Middleton’s derriere should be named “Pippa Middleton’s Bottomton”. hee hee! double note: I had to look up who Pippa Middleton is.